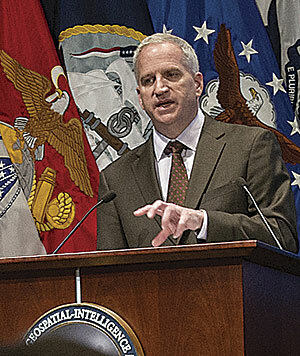 Robert Cardillo, director of the National Geospatial-Intelligence Agency, is overseeing the agency's expanding role in the US national security community. The US military first experimented with aerial surveillance during the American Civil War (1861–1865) when both Union and Confederate armies used manned balloons to conduct reconnaissance and artillery spotting. This vantage point also enabled increasingly accurate mapmaking by combining observations from the air with photos taken from the ground. From that humble beginning, military mapmaking has evolved significantly in both its use of technology and the essential part it plays in mission success. Today, it is central to all phases of operation planning, execution, and logistics. Because of the strategic importance of mapmaking to the defense and intelligence communities, a number of different government agencies have been tasked with producing and maintaining maps over the years. To minimize redundancy and potential inaccuracies, many of these agencies were consolidated into the National Imagery and Mapping Agency (NIMA) in 1996. To better reflect its primary mission in geospatial intelligence (GEOINT), the agency was renamed the National Geospatial-Intelligence Agency (NGA) in 2003. Robert Cardillo is the director of NGA. He began his career in geospatial intelligence as an imagery analyst in the Defense Intelligence Agency (DIA). Prior to his current post, he was the first deputy director for intelligence integration at the Office of the Director of National Intelligence. He has also served as the deputy director of DIA, as well as its deputy director for analysis. NGA is increasing assistance for worldwide humanitarian efforts by making more of its data open. Cardillo bases his leadership on principles he has developed over the years that he calls the four Cs: conveyance, content, and context, which combine to produce consequence—the ultimate goal of NGA. "We exist for one reason, and that is to enable mission consequence for our customers," said Cardillo. "We are shaping everything we do to ensure that we are delivering the optimum potential for their success." Best-in-class solutions are critical for NGA to maintain its edge in national security. This requires a skilled and experienced government workforce, as well as business partners that can provide the tools to maintain large datasets and perform sophisticated geospatial analysis. NGA works closely with commercial software vendors through Cooperative Research and Development Agreements to ensure that their offerings align with NGA technical requirements. To expand industry contacts and bring the latest technical innovations more quickly into the agency, NGA recently implemented the GEOINT Solutions Marketplace. It functions as an online exchange for the agency, vendors, partners, and academic institutions. 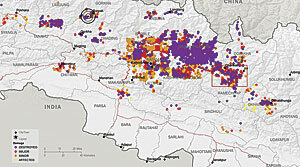 Leveraging the current state of technology is allowing NGA to transform into a provider of dynamic content and services—as evidenced by the maps and data it released related to the earthquake in Nepal. "This helps ensure that our agency maintains its transparency for acquisitions and allows us to implement them much quicker," said Cardillo. "It's a partnership that I refer to as Team NGA. I meet with industry leaders often so that they have a better understanding of our needs and expectations, which will help guide their research and development." Because of the nature of their work, the 17 agencies that comprise the US Intelligence Community have traditionally maintained and safeguarded their own data. However, with a need to simplify data access for quicker analysis and decision making throughout the community and a mandate to reduce costs, they decided to implement a common IT platform. In 2011, work began on the Intelligence Community Information Technology Enterprise (IC ITE), a shared-services infrastructure based on cloud computing. Earlier this year, NGA and DIA consolidated agency-specific portals into a common IC ITE platform on Portal for ArcGIS with the goal of the entire Intelligence Community eventually being able to collaborate around this shared service. "A key to better data analysis is the incorporation of georeferenced information because it can connect data that seemingly has no connection," said Cardillo. "So as part of the IC ITE, NGA collects, maintains, and serves geospatial data to the rest of the community." 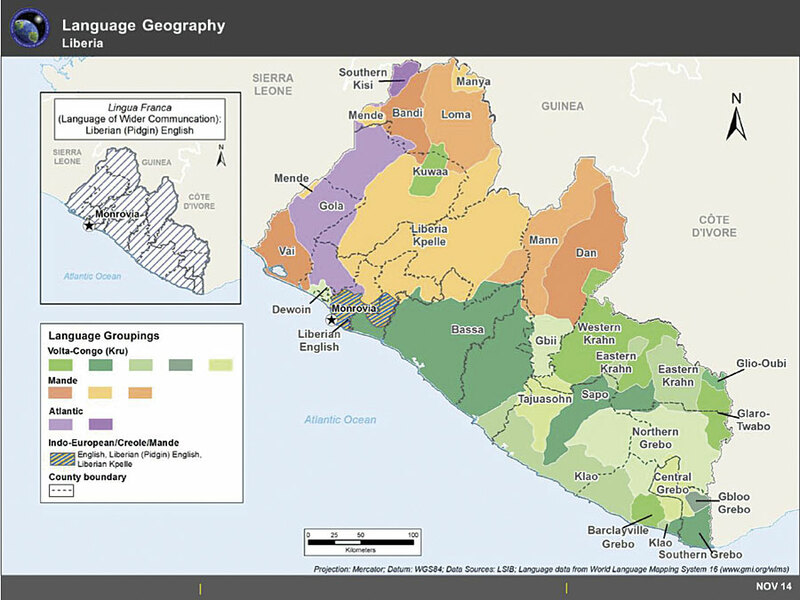 NGA's Ebola support page gave the public access to maps and data about known outbreak locations, treatment centers, language geography, and more. NGA has deployed Portal for ArcGIS to the Amazon Web Services Commercial Cloud Services (C2S) as part of the IC ITE environment for the first time on behalf of the Intelligence Community in a move that enables government agencies to better share geospatial intelligence. The deployment of the portal provides a single environment for analysts to securely organize and share data throughout the Intelligence Community and the Department of Defense. It is also the foundational step in consolidating multiple geospatial intelligence portals into a single NGA-provided portal, resulting in technology and license cost savings. "It is helping transform our agency from a traditional provider of static maps, charts, and analytic products to a dynamic content and services provider," said Cardillo. "Rather than submit requests to our agency, users will be able to access, depending on their security clearance, the maps and data they are looking for by themselves. This is a self-service model, but if you are uncertain about exactly what you are looking for, we are there to help you. "Because NGA is both a combat support agency under the US Department of Defense and a member of the US Intelligence Community, our mandate is clear regarding national security," he continued. "However, we also have a responsibility to support those international events that require our expertise but fall outside military operations. For example, when the president declared Ebola to be a national security issue, we supported the deployment of the 101st Airborne Division, and we have a great history of supporting the uniformed military. But we were also required to support the medical staff treating the Ebola victims, and this was very different for us. They didn't have military ID or clearance cards; they just had an urgent need for the data we could provide to them. And the solution was providing access to our extensive unclassified data via the World Wide Web." 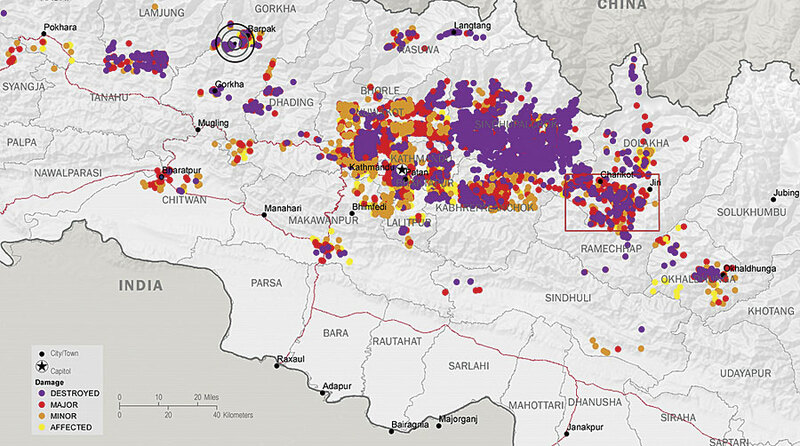 Immediately following the April 2015 earthquake in Nepal, NGA opened a public website to share unclassified geospatial data, products, and services. On October 23, 2014, NGA established its Ebola support page using ArcGIS Online to provide public access to known outbreak locations, treatment centers, airports and seaports, and hundreds of other maps and data services. 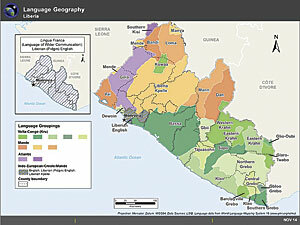 This public-facing website allowed relief agencies and other responders to access detailed information on the geography and infrastructure of Liberia and Guinea and build maps that include layers of information on Ebola treatment centers, mobile phone coverage, power grids, airfields, and more. While NGA has been very successful in maintaining national security using methods such as Activity-Based Intelligence, the increasing complexity of its mission requires an ever-refined granularity in its analytical methods. Anticipating and neutralizing an event before it can occur is the ultimate goal of any security agency, and NGA is beginning to apply anticipatory intelligence in its analyses. "Anticipatory intelligence is a methodology," said Cardillo. "Using our big data collection (and making certain assumptions and hypotheses), we can analyze the past behavior of an adversary in such a way that it will allow us to make a fairly accurate predictive model of its future activities. It's important to understand that we are not reinventing the intelligence business. We are just leveraging the current state of the technology and our connectivity to it in a new way. NGA carefully analyzes, confirms, clarifies, and presents information in a coherent manner so that all parties involved in a situation understand how the agency's findings pertain to them and their responsibilities. "Social media will be playing an increasingly large part of our analyses. In the event of an emergency, it can provide immediate local insights and a ground truth of the current situation," continued Cardillo. "However, as the nation's definitive source of authoritative geospatial intelligence, NGA has to be very careful with our analyses and distribution of crowdsourced data. The data needs to be carefully vetted and verified so that we can provide it to our customers with confidence. I have high expectations for its potential value, but we are being very thoughtful about how we will implement it. "For example, during the Arab Spring, we were getting inputs of all kinds. Some were from our traditional classified sources, but most were nontraditional, unprotected sources, such as social media, local news coverage, blogs, etc. Information that is misinterpreted or presented in a confusing way can result in an inaccurate or incomplete operational picture. So we worked hard to carefully analyze, confirm, clarify, and present our findings in a coherent manner so that whether you're a policy maker or warfighter, you could clearly understand the situation as it pertains to you and your responsibilities. "Because of the changing conditions in the world, NGA is increasing its support of worldwide humanitarian efforts, such as the recent Ebola outbreak in Africa and the devastating earthquake in Nepal. This requires that we operate in an increasingly open environment. While we have been very successful operating in a closed environment in the past and we will continue with those initiatives, we are trying to better understand our responsibilities in this new open environment. How do we structure our data collection and management to support an open environment? What kinds of analyses are needed? We clearly understand our responsibility, but we are approaching our expanded role with careful consideration."